In this example, the objective was to extend the new volume group to include an uninitialized entity (partition). Doing so increases the size or number of extents for the volume group. 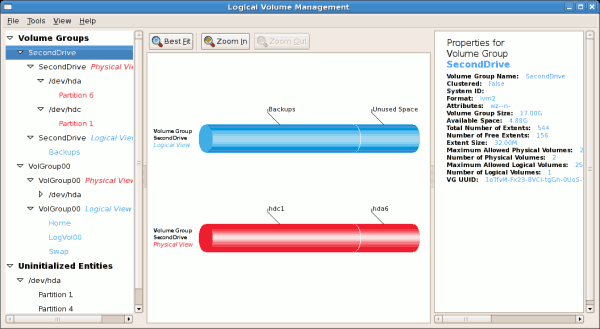 To extend the volume group, ensure that on the left pane the Physical View option is selected within the desired Volume Group. Then click on the Extend Volume Group button. This will display the 'Extend Volume Group' window as illustrated below. On the 'Extend Volume Group' window, you can select disk entities (partitions) to add to the volume group. Ensure that you check the contents of any 'Uninitialized Disk Entities' (partitions) to avoid deleting any critical data (see Figure 14.13, “Uninitialized hard disk”). In the example, the disk entity (partition) /dev/hda6 was selected as illustrated below. Once added, the new volume will be added as 'Unused Space' in the volume group. The figure below illustrates the logical and physical view of the volume group after it was extended.